Does you Family do a lot of Baking during the Christmas Season or Advent Season? There are so many wonderful and beautiful Christmas Cookie Recipes out there, but there are some that you just seem to make year in year out. Those recipes have become a stable to transport the Christmas Joy, that you even forget the Origin of the Cookie. Much like these Vegan Vanilla Kipfel, which are a stable in so many German Households but indeed “originates” from Austria. Although the town of Nördlingen in Bavaria also claims the title. The Christmas Pre Season is so much more beautiful than Christmas itself. It is a time when the Dark get illuminated, and we make the World Sparkle. Have you ever tried a new recipe and entirely fallen in love with it? Well, this happened to me a couple of years ago. I remember this day it was a Sunday: a day that was grey and slightly rainy and all I wanted where some Happy Thoughts. It being the Pre Christmas Season, there was nothing better to brighten my mood than to bake some Christmas Cookies while listening to completely cheesy Christmas Songs. (Of course, I was humming and dancing along, who wouldn’t?) It’s all about getting in the Mood. As I was humming along and after completing the first batch, of Gingerbread Cookies, I realized I had no more eggs left. OH NO! Somehow I just didn’t want to give up yet and wanted to make some more. I was in the Christmas Cookie Baking Mood. At this time I have been playing around with Vegan Baking at the time, the idea fascinated me, Baking without eggs but still get delicious results. There had to be a Recipe out there that I could continue my Baking Spree after all the Family requested Vanille Kipferl. A Christmas Cookie that very much belongs to the pre-Christmas Cookies that are a must. Well, their voices where heard and it’s nice when you can make everyone happy. These Vanilla Kipferl are super Moist yet a defined crumble that produces the melt in your Mouth experience. The Vanille and Almond sum up the whole Cookie. A Perfect Cookie that you would not even know was Vegan. Mix Flour, Starch, Almonds, Sugar, and Salt together. Cut the vanilla pod lengthwise, scrape out the core and add to the Mixture. Cut the Margarine into squares and mix into the dry ingredients. Mix and Knead until a firm dough is formed. 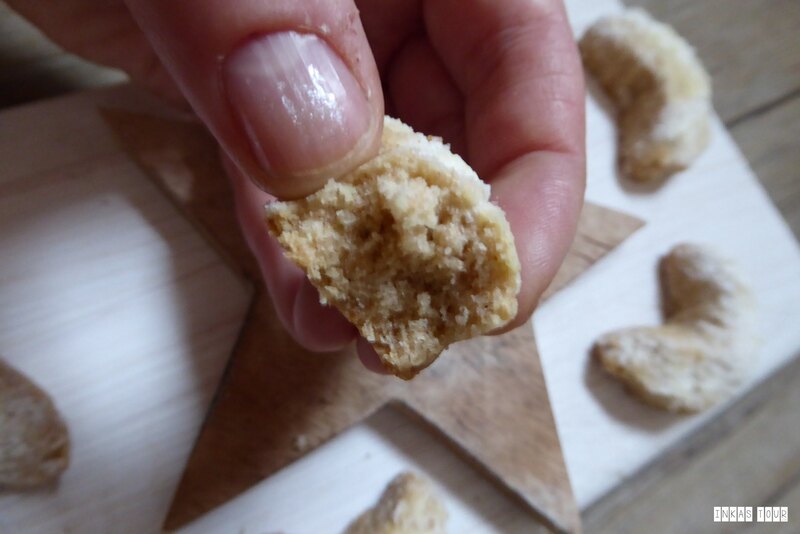 ** If you find that it is a little too crumbly, add 2-3 EL Soja milk to get a little moisture into the Dough. Divide the dough into four pieces and roll into 1,5cm Rolls. Wrap the individual Rolls into Saran Wrap and place in the Fridge for 30 Minutes. Preheat the over to 175ºC Upper/ Lower Heat. Prepare two Baking Sheets with Baking Paper. 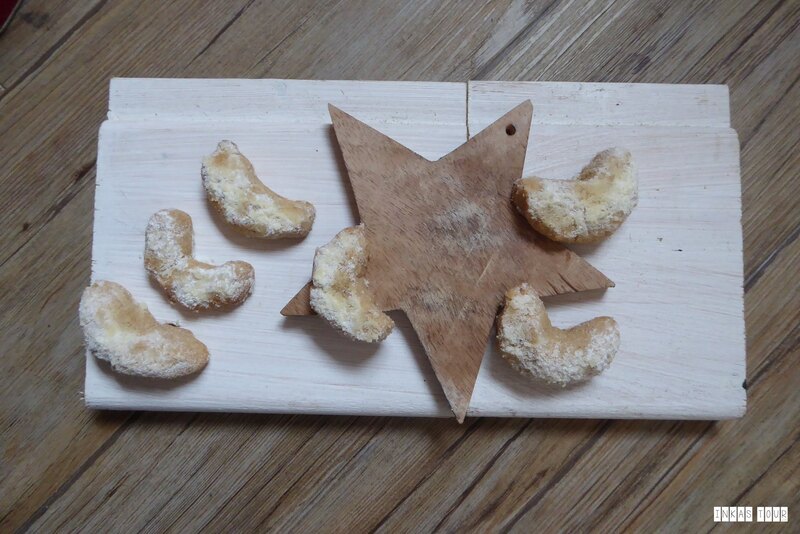 Cut 1cm Slices from the Rolls and form into a Moon shape (half crescents). Lay them on the Baking Sheet lined with Parchment Paper and repeat the procures for all Slices. Bake the Kipferl from 10-15minutes until the edges are golden brown. In the meantime mix the two packets of Vanille Sugar with the Icing Sugar in a Strainer. 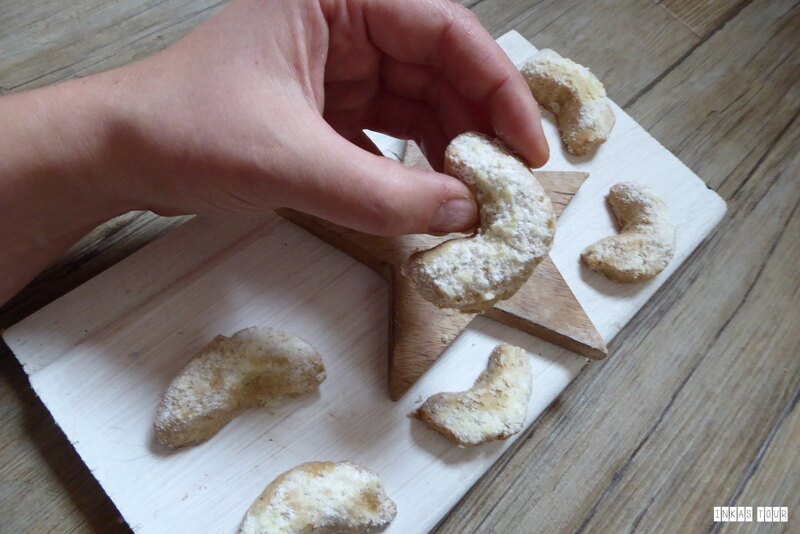 Once the Kipferl are baked, sprinkle the HOT Cookies with the Icing Sugar mixture using a S. Let the Kipferl cool. A total of 5 days later, and this batch of at least 60-70 Cookies (sorry I did not count) is already gone. Oops! Guess i'll have to make more. I was even told by Brother, that these are some of the best Vanille Kipferl that he has ever had, and I agree not only do they have that crumble melt in your Mouth syndrome, but you would honestly never know that they are Vegan. I honestly love this recipe, because all the Ingredients you are guaranteed to have in your Pantry. No weird or strange stuff that cost a fortune, just everyday items. Nada. 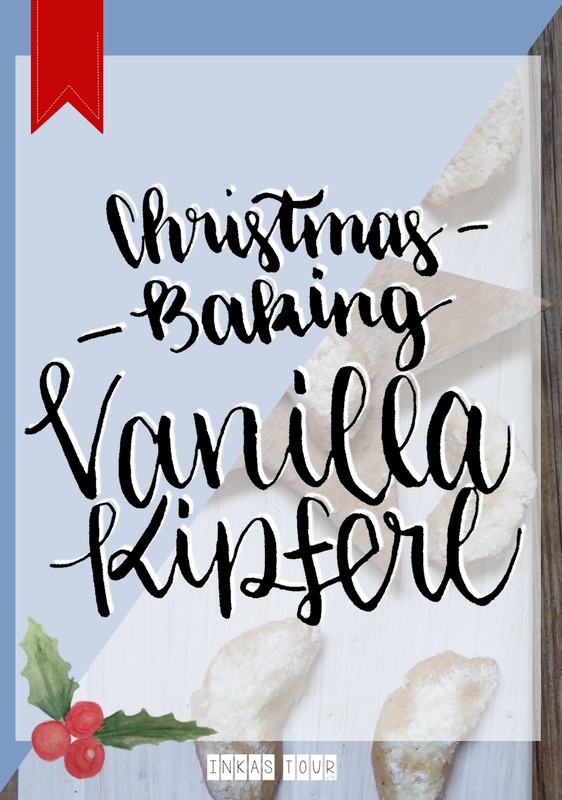 Do you have a Christmas Cookie Recipe that you love and make every year because it brings out the Christmas Joy in your Face like this Vegan Vanillekipferl Recipe? I found this great recipe from Cake Invasion. Thank you for this great recipe. Little did I know how fabulous it would be when I first started making them, I mean yeah I was totally skeptical.